Home > Scots > Let us Dae or Dee! Let us Dae or Dee! “LET US DAE OR DEE!” The French springheids o Burns’s Jacobin slogan-cries. Robert Burns’ pairt-takkin fir the French Revolution is a weel-kent pairt o his legend an bides, mair nor twa hunner year efter his daith in 1796, an ongangin pynt o poleetical an academic stramash in Scotland. Aither tae ding doon his politics, tae excuise it, ruise it, or tae wiss he haed gaed faurer, the analysis o Burns’ French leanins aye maks the peak o his biographies – whilk cannae but refleck thiir scrievers’ ain pairt-takkins. Houaniver, yon debates hae aften yokit thaimsel muckle mair wi the Scoto-French dimension o the life o the man nor the wark o the makkar. Truelins, gin a wheen o Jacobin witterins o Burns’ life hae been weel reportit an flytit ower, the French springheids o some o Burns’ best kent poems haes scarcelins been brocht tae mind. 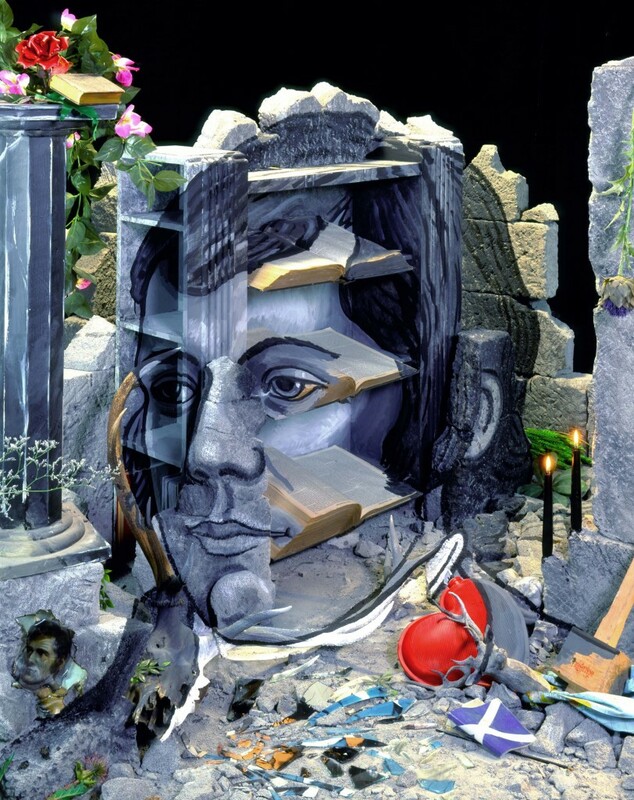 It’s nae afore Robert Crawford’s 2009 biography, The Bard, that (tae ma kennin) a muckle biography o Burns heichlichtit the French influence o twa o his maist kenspeckle poems: ‘Scots wha hae’ an ‘A Man’s A Man’. Indeed, baith o thaim include indirect owersettins o the French raidical slogan-cries: “Vivre libre ou mourir (“Live free or dee”), fir the sang o Bannockburn, an ‘Ça ira!’ (‘it will dae’ or ‘it will gae’) fir the sang cantit by Sheena Wellington at the openin session o the reforgaithert Scottish Parliament in 1999. Unner the licht o Burns’s observations aboot his ain poem, the hindermaist stanza o ‘Scots wha hae’ taks on a gey new sense. (the caipital letters are in Burns’s oreeginal version). As “not quite so ancient” events were aye in awbody’s thocht, the gangin thegither o “LIBERTY” an o the verb “DEE” were belike tae mynd the reader o the auld warld-kent revolutionary slogan: “Vivre Libre ou Mourir” (Live Free or Dee). Awtho Burns didnae owerset yon slogan direckly fae French, favourin the alliteration atween “Do” an “Dee”, the reference, in 1793, wad hae been plain as parritch! A hunner an fity towmond syne, in 1957, yon wis still kenable fir Samuil Marshak, the Soviet owersetter o Burns, wha kythed “Let us DO or DEE” intae the Rooshian “smert ili svobodu”: “Death or Liberty”. The heich kennin o the French revolution in the USSR micht explain Marshak’s mesmerisin tent o yon French-Scottish poleetical link. Siclike, fir Burns’s weel-kent poem, “A Man’s a Man”, the owerwurd “for aw that” kythes sib tae ane ither French slogan: “Ca ira!”. Yon wis areadies mentiont by Marylin Butler in the 1997 buik Burns and cultural authority, whaur she scrievit that “A Man’s a Man” wis “the closest rendering in English of the letter and spirit of the notorious Jacobin song”. A wheen pynts can be makkit tae uphaud Butler’s argument. Furst, “for aw that” an “ça ira” are siclike. They hae the same nummer o sylabes (three), they baith stress the last soond “a”, an they are baith cantit ower an ower: “for aw that an aw that”, an “Ah, ça ira, ça ira, ça ira” fir the French sang. Saicontly, “ça ira” wis weel kent tae Burns. Forby, he wis reportit tae hae cantit the revolutionary sang in Dumfries Theatre in 1792, the same towmond he screivit the poem, ‘The Rights of Women’, whaes hindermaist lines are: ‘Let Majesty your first attention summon / Ah, ça ira! The Majesty of Woman’. Hinderly, anither witterin is gied by Burns himsel in the hindmaist stanza o ‘A Man’s A Man’ whan he scrieves: “Then let us pray that come it may / As come it will for a’ that / That sense and worth o’er the earth / Shall bear the gree an a’ that”. The line “as come it will for a’ that” is a direct owersettin o the French slogan. Ca ira means “it will dae”, or “it will come” an is generally said in a comfortin wey, whan a body is tholin mony a haurdship. “As come it will, for a’ that” proports a sense o radical howp as weel as the awaurness that “a’ that” isnae braw the noo, an haes yet tae be tholed afore it gets better. In this, it perfitly mairres wi the meanin o the oreeginal French. Truelins, yon heichlichts Burns’s little-kent abeelities as an owersetter. Unhappily, nivver were yon Scoto-French poleetico-cultural links stresst by the French owersetters o Robert Burns. In Léon de Wailly’s 1843 an Jean-Claude Crapoulet’s 1994 versions o “Scots wha hae”, “Let us do or dee” is owerset intae “Vaincre ou mourir” (“Win or Die”) an “Il faut se batter ou mourir” (“Ane maun fecht or dee”). Yon are fair warlike slogans but they dinnae cairry ony historical or poleetical meanin. Siclike are de Wailly’s, Angellier (1893) an Crapoulet’s owersettins o “for aw that”, whilk becomes “après tout” (“efter aw”), “malgré tout” an “en dépit de ça” (naewistaundin o that). The lest twa were belike influencit by the successfu 1843 German owersettin o “A Man’s A Man” by Ferdinand Freiligrath: Trotz Alledem (naewistaundin o that). Yon braw version o Burns’s ode tae human britherhood thrivit muckle fae the 1848 German revolution onwart, tae the pynt at it wis e’en yaised by the communist leader Karl Liebneckt as the teetle o the hindermaist airticle he scrievit afore his execution in 1919. Gin Freiligrath’s revolutionary version o “A Man’s a Man” shud hae inspirit French Burnsians tae mak a radical owersettin o their ain, thai misfortuinately nivver tuik tent o the French reference whilk lies at the hert o the bard’s poem. A défaut de victoire ! Enfin ! C’est aujourd’hui ! C’est le jour ! C’est l’heure ! Les fers du désespoir ! Par l’oppression vile et ses malheurs en chaîne ! Par vos fils enserrés dans leurs serviles chaînes ! Pour les faire affranchir ! A bas le prétentieux usurpateur, à bas ! Qui le tient courbé comme ça ? Osons, les pauvres ! Ça ira ! Ca ira, Ca ira ! Nos travaux humbles, ça ira ! Mais l’homme est l’or, ah ça ira ! Et de talent et ça ira ! Ça vient, ça vient, et ça ira ! Seront des frères, ça ira ! Burns wis aye an auld ally ! Paul Malgrati is a historie graduate o Sciences Po, in his hame ceety o Paris, as pairt o whilk he spent an excheenge year atween 2013-2014 at the university o Sanct Aundraes. He’s noo returnit tae Sanct Aundraes an Scotland tae yoke hisel tae a PhD on the poleetical yaises o Robert Burns’ memorie in 20th centurie Scotland, an is gey blythe tae be back an tae forder Scotland’s cultural an poleetical cause in ony wey he can. “After two half hearted attempts to start medical practices in London and then Dumfries, William set out for a ‘grand tour’ of Europe, however, he got no further than Paris, the flashpoint of the republican revolution. When he arrived there, the great city was a hotbed of discontent. William, the idealist, found himself surrounded by like minded people who were getting ready to change the world. The young reformers that William befriended were to be the leaders of the revolutionary forces that were to purge France of its aristocracy. At his family’s pleading, William returned to Scotland late in 1789. They, implored him to pursue a medical practice, but young William’s blood was fired, and following two more failed practices he set out for London with £500 that had been left to him when his younger brother died. The revolution in France was now underway and William itched to be there, but he was recruited to procure arms for the revolutionary forces. He went to Birmingham were he ordered 20,000 daggers, but on returning to London, found himself the centre of much attention following a speech in the House of Commons by Edmund Burke who had condemned him for his Jacobin sympathies and revolutionary actions. Wisely, William fled London and headed back to France were he was welcomed by his now powerful friends. He enlisted into the National Guard and was given positions of great trust which culminated in him commanding the guard that led Louis XVI to his appointment with the guillotine on the morning of 21st January 1793. ” Let us Dae or Dee” such a succinct insight into the Scottish psyche. The description of Scots as poet warriors seems quite apt by association. If only our present day leaders were as brave. Nicola Sturgeon and her lieutenants look as if they are about to retreat from the field. Rather than take the fight to Theresa May and her Brexiteers and claim this general election as our referendum she prefers to wait and see what the result is before she makes her next move. It makes you ashamed to call yourself Scottish. “It makes you ashamed to call yourself Scottish” No matter what Richard I could never be ashamed to be Scottish as I consider myself fortunate winning the birth lottery of life. Maybe perhaps there are not enough Scots in Scotland as there is now three distinct groups of Scottish inhabitants. The archetypal Scot, the hybrid Scot and other residents. Scotland’s once deep and wide gene pool now scattered puddles. And I’m partly to blame being an expatriate Scot.The question is as Scotland’s population has remained reasonably stable over many years just who and from where was I and all the other Scottish emigrants replaced? The once expansive Scottish family where no Scot is a stranger, just folk not yet met gradually being unravelled, the exchange of knowing empathy, the instant joy of trust and association Scots took for granted, as a boy in Scotland all this was just a normal part of growing up Scottish. –	The last/now outdated 2007 census indicated this group to be around 10% of Scotland’s population (albeit probably understated then), and with growth it is now at least 15%; in a more recent rural/island census, people from England accounted for as much as 30-50% of the population in various parts of Scotland. For those of us seeking Scotland’s independence, a downside of this trend is that some 80% of people from rest UK/England living in Scotland indicated in voting intention surveys that they would vote No to Scottish independence. This is about twice the likelihood of Scots to vote No. It fits where I live as most of my neighbours, some good friends I would add, are now from south of the border and practically all voted No, and in elections they tend to vote against the SNP as a matter of course. They ‘vote Britain’, as it were, irrespective of Westminster policies it appears, and so tend to vote on the basis of their preferred ‘nationality’ (i.e. British, not Scottish). The problem for those of us advocating Scottish independence is that this group now accounts for at least 30% of all No voters, and they are probably least likely to change given the national/cultural perspective. I expect this trend will continue and that people from rest-UK will soon make up over 20% of the Scottish population; once the rate of inflow exceeds 20% (as in Wales) this suggests that independence will become even more difficult, if not impossible, to achieve in future. In a nutshell, year on year Scotland is in all probability losing Yes voters and gaining No voters, and that is perhaps one reason the Tories in Scotland seem a bit more confident again. ‘That the SNP campaigns for Scotland’s independence at the UK General Election on June 8th 2017, which would be democratically secured via the party winning a majority of seats in Scotland, and with independence supporting parties securing over 50% of the vote in Scotland’. As the man said: “LIBERTY’s in ev’ry blow”. We don’t need the final clause “and with independence supporting parties securing over 50% of the vote in Scotland’. We just need 30 SNP MPs. That is the FPtP system. Their system, their rules. We should stick to the rules and keep it simple. One statement manifesto, ‘A vote for the SNP is a vote for independence’. And yet English born people of my acquaintance are just as able, like we who were born in Scotland, to realise that independence has a lot to offer Scotland and an independent Scotland has a lot to offer to the rest of the world. Not just young ones either. Many in their 60’s and 70’s are enthusiastic members of our local Yes group. It is civic, not ethnic, nationalism on offer, and no good will come of demonising ethnic groups or age groups. We have to offer a future in which all are included, and talk of swords and blood and so on is not going to reassure anyone. Much of Scotland’s past is extremely bloody, and our part in the British Empire is both violent and complicit. No point in glorying in the past as the Tories are, let’s look to a future in which we gain our rightful status by peaceful and lawful means. And the big moment is coming soon. Teresa May is incapable of understanding, let alone preventing, independence. So we need to keep the heid here. There would be nothing our opponents would like more than some bammer doing something stupid, and nothing more calculated to put people right off the whole idea of nationhood. You appear to assume the English are determined to exchange Scottish nationhood for British/English nationhood? That is not how 80%+ of them vote. Thank you Alf and Richard for your informative response. I referred to the last referendum as the egg shell referendum, so polite, so circumspect, so PC, so Scottish. Whatever you do don’t scare the horses, especially the English horses, which was so comical as they had already gathered in one mighty herd and had moved from a trot to a canter and were already at full gallop all headed for the NO Corral. In regards to the English settlers they probably have a feeling of some resentment towards Scotland having to concede that Scotland surpasses any attraction their former homeland offers.This is a concession against their pride regarding the fact that their former concept of ye merry old England is now defunct. There has always been a level of jealousy directed towards the Scots by the English recognising that the Scots have a distinctively different identity in almost every aspect. This difference being recognised world wide. Scots are welcomed and held in high esteem wherever they choose to settle, no something the English can lay claim too. There is one redeeming grace though the children of the English immigrants are speaking with a Scots accent and will identify more and more with being Scottish. For being Scottish is just that, a state of being that anyone can embrace and become Scottish. It should also be noted that hundreds of thousands of Scottish people live happily south of the border. There is, in my opinion, far more that binds England and Scotland together than divides us, to quote Jo Cox. England remains a country of massive opportunity for people from many different countries. In my small street of 14 houses there are two Irish families, three families with one Scottish parent, an Italian family and a Canadian family. And we all get on very well. The use of the term ‘English Settlers’ is a bit unsettling. It smacks of the xenophobia you have directed at the English. I think the very different scale of inbound migration is important here. How would you feel if, over the past 20 years, 10 million Scots had moved to England (instead of c. 600,000) and, now making up 15%+ of England’s population (instead of 1%), taken it upon themselves to mostly vote against English independence (and accounting for c.30% of a No vote, effectively helping prevent English independence), in order to protect their British ‘nationhood’? That was a long bow you drew, perhaps an English longbow linking my description of the English in Scotland as settlers and my supposed xenophobia towards the English. Firstly the English people are of no concern to me as I feel no particular empathy or identification with them. I have never thought off or called myself British, being born Scottish I have no requirement for a secondary politically constructed identity. However I do despise their authorities and establishment including royalty, as I feel any sensible Scot should. In regards to my post I would appreciate your opinion on all of my observations for I feel it would prove quite revealing from an English perspective.